Last night, on the day that City Councillor Tito Jackson announced that he will challenge Mayor Marty Walsh, the 7th Suffolk District’s newly elected State Representative, Chynah Tyler, hosted her first Town hall meeting at the Dudley Branch Library. About 75 people showed up; many questions were asked of her, the majority of them real estate related. The issues voiced — the ubiquity of real estate development, the lack of affordable housing — are not new to Roxbury. No part of the City — except maybe the Seaport District, which didn’t exist until a few years back — has seen a fiercer rise, these past few years, in house prices and rents; and only South Boston can match what has taken place in the neighborhoods that Tyler’s attendees live in. Tyler had no good answers to the questions posed. How could she ? The bull market gripping Roxbury cannot be turned back, and why should it be ? Long-time homeowners in the region, who’ve never had much (thanks in part to persistent racism), have every right to cash out, if they choose to, the lottery ticket prices they find themselves now holding. That this situation pits homeowners against younger residents who would like to become owners doesn’t make Tyler’s conversation any simpler. I think, however, that she won a thank you from her questioners simply for daring to confront the real estate issue. People complained, as they have all along, that development takes place without “the community” knowing about it. This isn’t actually true; all development projects must, in order to secure BPDA approval, go through the agony of a “community public comment hearing,’ at which opponents always show up; but it’s fair to say that many residents don’t know when said hearings occur and feel helpless as project after project gets built all around them. Many people voiced that complaint to Tyler at the Town Hall. Other issues were raised. One woman pleaded that there would be “more funding” for schools. Tyler made it clear that the State’s budget is in deficit already, thus “more funding” isn’t likely. Tyler alluded, also, to the process by which the legislature of which she is a freshman member arrives at budgets — without saying that by “the process” is meant “the Speaker decides.” There isn’t much that Tyler could have said that her listeners would have accepted. One got the impression that the people at her Town hall feel that their destiny — and Tyler’s — is entirely in other people’s hands. Where real estate matters are involved, the impression is correct. Tito Jackson, in his announcement, made it clear that he would be the voice of those “being left behind,” in other words, those whose destiny lies entirely in other people’s hands. What he can do about it, he didn’t really say. In the past he has been willing to kill development — and the jobs and spending that they bring to his neighborhood — rather than see people “being left behind.’ But all that his willingness has accomplished is to assure that everyone in the area gets left behind, not only some of the people. What I did not hear at Tyler’s Town hall, nor from Jackson’s candidacy announcement, was any hint that Roxbury’s real estate boom represents a tremendous opportunity, a boom for locals to take advantage of. There are many routes to advantage the real estate boom : new businesses to serve wealthy new residents; new service industries, including electricians, plumbers, landscapers and architects; new technology start-ups, restaurants, boutiques to offer the newcomers must-have stuff. Some neighborhoods of Roxbury now enjoy million-dollar house prices and up; how can the buyers thereof not be a huge bonus for locals to exploit with entrepreneurship ? Such questions were not asked at Tyler’s Town ha;ll, nor were they addressed by Tito Jackson. This to me is a general failure of imagination, confidence, and ambition, in a city whose Mayor is doing everything he can to encourage every resident to pursue and embrace all three attributes. ^ 23 Linwood Street in Fort Hill, Roxbury : the new Concord Square ? Much discussion has taken place these past three months concerning real estate prices in Roxbury. 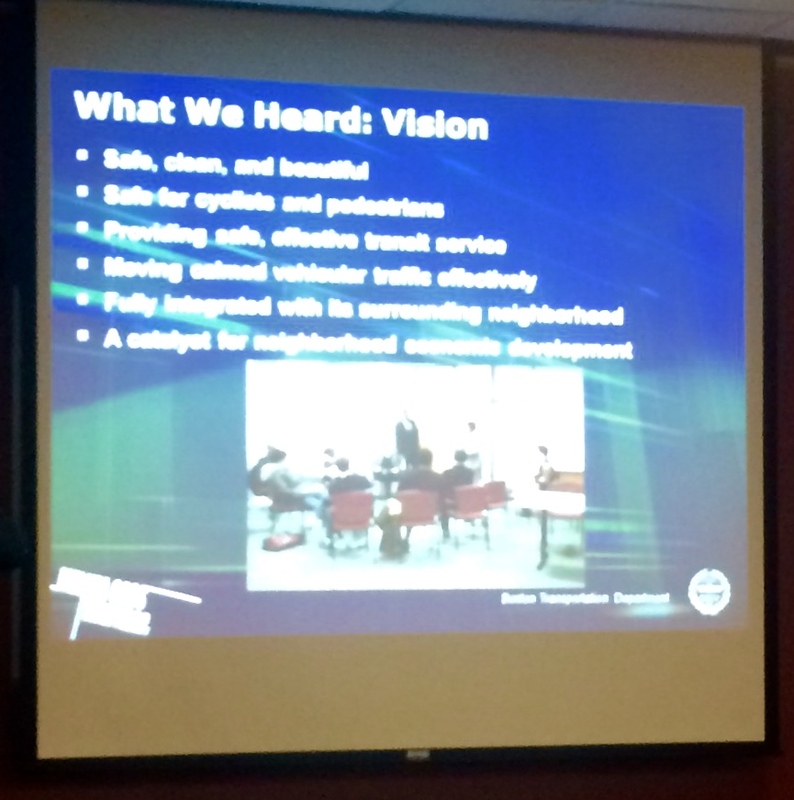 The discussion now extends to Mattapan, which lies directly South of Roxbury along Blue Hill Avenue. 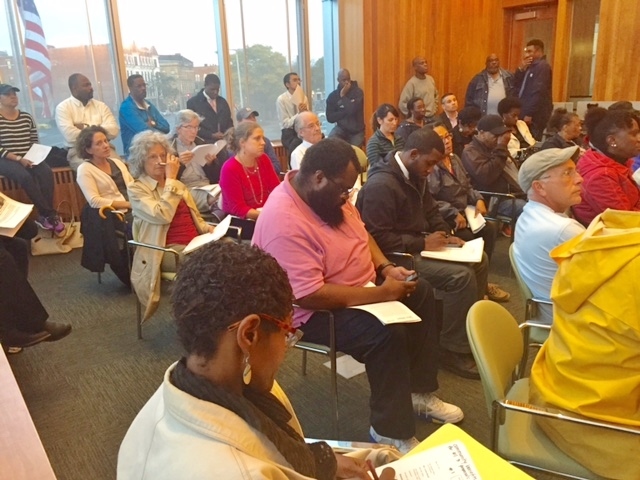 I understand the concern that some long term Roxbury residents have for their housing future. For those who live here, sale prices and rents are rising much faster than income. The median income of Roxbury households amounts to about half that of Boston as a whole. The disparity will grow. What is to be done ? I’m afraid I have no good answer. Every solution I’ve heard involves taking the value of real estate away from someone and giving it to someone else. I cannot support that, nor will it work. We’ve heard the arguments why long before : rent control leads to corruption and disinvestment. Affordable housing agreements overburden a community already hosting more than its fair share of such. The land use trust, a re4cent innovation, does no better. At some point the trustees are going to have a huge argument, as prices soar, between those who don’t — yet — want to sell and those who see the rewards and do. The land use trust sounds good. Because the trust artificially directs a large portion of house value to the trust assets and away from individual units, the cost of such units seems affordable. As long as house prices do not appreciate enormously, the diverted value might not be missed by most. But what happens when the trust’s houses are worth three, four, five times what was paid at the time the trust was created ? Homes in Roxbury go for $ 400,000 to over $ 1 million. What happens when, in 20 years, the average price reaches $ 3 to 5 million, as is the case in the South End today ? I think Roxbury residents had better get used to the prospect that in 20 years at most, maybe as little as six years, prices will at least double and rents will rise sharply too. This is a huge lottery ticket for long time homeowners, who have never had much (thanks in part to citywide racism). Fact is that new residents are coming into Roxbury every hour, changing the neighborhood — and, yes, raising its percentage of non-Black residents toward the tipping point, as happened in the South End from 1980 on. This change is going to upset many — already is — but if non-Black people,. who have by far most of the money, want to buy, very few owners are going to refuse to sell at a price few will want to refuse. People troubled by this market force call it “gentrification,” a term heavy with pejorative. As if those who “gentrify” are, in some way, an opponent. I doubt that the “gentrifier” feels such., She probably enjoys the idea of a great house at a price one-quarter of that in the South End, or less, and likely enjoys the prospect of living in a diverse neighborhood. But to those who see “gentrification” arising — even as far away now as Mattapan, where activists term, certain streets “susceptible” to the process (I wonder what criteria they use to determine this ?) — the coming is of a storm: of unwanted changes no one seems to know how to stop. Can Roxbury of the coming decades retain more than a very few of its current, Black residents ? For homeowners, the choice is theirs to make. For renters, the future looks grim. We need to raise the City’s minimum wage to $ 15/hour at least, and we need to build enough modest=-price condominium-type units so that supply exceeds demand. There really is no other way, other than to return the neighborhood to its 1975 state of abandonment, disrepair, and danger. That would lower every price quick and in a hurry : but of course no one wants that. So the riddle is, how does Roxbury accommodate renting residents who want to stay ? Subsidized housing may be the only workable answer; yet that too involves deferring real estate value into other, future hands. Ultimately, this is a story about racism. No one laments that the population of Roxbury prior to the coming of people of color — people who lived here in, say, 1940 — has almost entirely left. No one laments the Hannas, Feltons, Kittredges, Quandts, Timiltys, Martins, O’Learys, Levitskys, McDonalds, Yunglings, Sciarappas, Candoras, Fitzgeralds, Currans, Magri’s, and Glynns — Latvians, Germans, Irish, Italians; even some Yankees — having decamped to West Roxbury and the South Shore, because they were white and had options. And because wherever they moved to, welcome was assured them. With today’s Roxbury residents it is different. Black Roxburyites can move, but who knows how welcome they will b e in the communities they may move to ? Meanwhile, welcome in Roxbury is not a problem; it’s their home. It is they who do the welcoming. When Roxbury’s Black residents leave, as many are now doing either by choice or by no choice, even the well rewarded homeowners among them give up that assured welcome in exchange for a who knows what. This prospect can never be easy for people who know only too well that many non-Blacks will not welcome them as new neighbors. That is the issue that will not go away and which gives some force to the fears being voiced these days about soaring real estate prices in Roxbury. ^ The locus of Innovation aspirations in today’s Roxbury : a reach too far, or a shore to be conquered ? I have attended gatherings of the mission’s backers and of those it is sending into our New World — for is not what they call “innovation” a world unto itself, with its own orbit and gravity ? — and I have seen its promise and also seen its uncertainty. When we first came to this place, our coming was itself innovation; for “Roxbury: did not exist, and it was unprecedented that it should come into existence. We could not have succeeded without the backing of merchants of the City of London; without t.he voices of our ministers to inspire us; without planters willing to create plantations where there had been only puddingstone and brush; without families ready to accompany our planters into the unknown, families from all over England who made commitment to do or die. Can the sponsors of the “Roxbury Innovation District” succeed on less ? Perhaps; because the apparatus of a town (now city) is in place; because the needs of an “Innovation Center” are known; and becsuse the planters are already here besides. This time, only the doing remains to accomplish. Yet the components of planting Innovation include all that brought our first Roxbury to success : critical investment of merchant funds; voices of inspiration; and, most important of all, a task. For our first Roxbury, the task was to plant. For the “Innovation” Roxbury the task, as i envision, is to invent. It is not enough to pick a locus. One must conceive; and said concepts must persuade the merchant financiers of the value thereof; and that the people seeking to invent have the abilities necessary to wrestle said inventions into actual shape. It was no different for us; and the makers of Roxbury “Innovation’ should hold i mid our example as they seek their new. 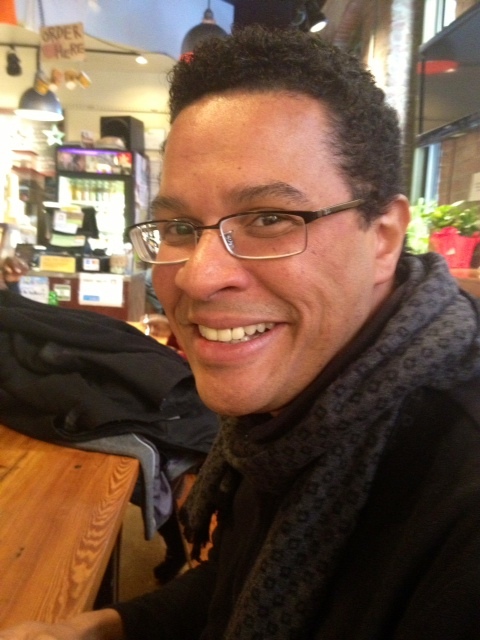 Said tocsin being sounded by me, Thomas Dudley, what assessment may we take of Innovation Roxbury thus far ? Below I offer the observation of a friend, Ed Lyons, who is the chief executive officer, in Boston proper, of a technology “start-up,” as technologists term their explorations. To which I append my own observation. Can government create innovation and prosperity all by itself? I decided to check up on this effort with my kids yesterday. But the keystone of this project is the massive renovation and expansion of the Ferdinand building, renaming it the Bolling building. They have moved about 500 Boston Public School back-office employees (clerical staff) there. They got a nice deli to take up some of the bottom floor. They will have an “incubator” in that building where startups can live and potentially help out the school system. There is lots of happy-talk about how great this is all going to be, even though there have been many problems and delays with the project. I could write a lot about this, but here are some highlights about my thoughts. I think I’m the kind of civic-minded tech entrepreneur that would find this place appealing, right? 1. Of all low-income neighborhoods to choose from in the southern half of Boston, I *get* why they picked this one – both politically, and practically. If we had to do this kind of project, I’d probably choose this spot also. 2. So much of why startups want to locate in certain places is because of who is there and what they are doing. It’s all about being near people and institutions that can help. I can’t see a less desirable group of people to be around than the back-office staff of BPS. I worked with them a lot several years ago when my wife and I worked on the BPS website down at Court Street. Nice people working in same clerical jobs for years. Unionized to the max. Uninterested in changes. They leave work at 5 on the button every day. Comfortable with their filing cabinets all around them. Oh, yeah – they need new technology and ideas. They need startups around them. But I doubt they would absorb anything. And what’s in it for the startups? I spent about 90 minutes there looking at what businesses were there. Nothing that would interest me. Nevermind there isn’t a nice bar or restaurant that I’d go to. They’ve got the nice deli in the building. That’s it. One place. 3. The advantage of the colleges nearby was way smaller than I would have thought. My kids and I walked from the Fenway schools all around the neighborhoods between Ruggles and Dudley. Tons and tons of public and low-income housing. Some of it was absolutely wonderful, like Madison Park. Some of it wasn’t. But once you walk through all that, Northeastern and Wentworth might as well be 100 miles away. Nobody from those places will ever step foot in Dudley Square on the way to anything. 5. There just isn’t enough there to attract me. If there were a few cool bars and restaurants, that would be a huge help. I also was turned off by the 99 cent store, the steel nighttime gratings that the stores pull down over their store fronts to feel safe at night, and lots of unemployed men just hanging around in groups drinking out of paper bags and talking loudly on the street. So ultimately, I don’t see how this would work. Perhaps the goal isn’t to draw in people from the outside, but get innovators from Roxbury to build businesses there. If that’s the case – God bless them. We need them. But if the goal is to get people from outside Roxbury to locate or re-locate there – if the goal is to compete with other places in the city, I don’t see that working at all. Yes, my friend Jascha – the city CIO – might be able to get ed-tech startups in that building to help the school system. He’s probably the most innovative and amazing guy in city government. But he’s already stretched thin. He can’t do everything. Outsiders have to buy into what the city is doing there. We will see how it goes. I will return again to see how it is going. I hope it works. Somehow. — Ed Lyons, CEO of AdMixter, Inc.
Now to my own observations. It should be remembered that when we first planted “Roxbury,” we were given charter by Parliament and King, but nothing further, as it was their wish merely to be rid of us and our contraventions. Said Parliament and King were also mindul that previous attempts at plantation, made with their sponsorship and by their procedures, either had failed or survived merely. Yet we who planted Roxbury entirely of our own, and by our own devisement, succeeded. I do not agree with Mr. Lyons that the moving of 500 Boston Public School staff into the Bruce Bolling Building is a negative. Said workers bring spending money into Roxbufy; purveyors of things that people spend money on are sure to set up shop thereall to provide; if not yet, then soon enough. Nor do i agree that the ubiquity of place names memorial of only one era of Roxury, people of color dominating both place and soul, in any way impedes the launch of Roxbury “Innovation.” What is in a name to one may be of no matter at all to another; and I know of none to whom said Roxbury names give offence. Nor does the prevalence, in the streets abutting the “Innovation,” of unemployed men loitering with beers defeat the Innovation experiment. Nor the presence of grated shop fronts. In great cities newess arises cheek by jowl with unpleasantness. So we ourselves arose in a London much dirtier and lurking than the Roxbury of now. Where I do agree with my friend, however, is the predominance of good intentions over needful apparatus. Innovation, as he has written, cannot occur merely because we want. There must be innovators; and they must have innovations in mind that command financers to say “yes, that can work.” I agree as well that Innovation doth not prosper in isolation; discussion and rivalry seem required. Was it not thus with us of 1630 ? As well I agree with Mr. Lyons that Innovation doth not everything; that expectations of it may outrun the actual; that political leaers may abuse the Innovation idea for their own, electoral sleight, or oppose it for advantage; said politics has befallen Roxbury inovation to its detriment. 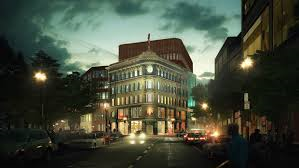 Mr. Lyons cites the matter of a hotel proposed, nearby to Dudly Square, by a builder and the opposition to it, on political grounds, that has set said proposal back. This week approval thereof was given by the Board that oversees such matters; yet the memory of a year’s delay lingers in the minds of persons who might otherwise be persuaded to finance Roxbury Innovation. The Innovation experiment in Roxbury has neither succeeded yet nor failed. It is, as it were, en route — as were we, during the long passage by ship from Portsmouth to our landing on Boston shore. No one could tell, during our passage, whether we would safely land or be driven by storms to our doom. We sailed day after day under the mercy of weather. Thus with Roxbury Innovation today. It saileth from a safe shore to an uncertain one with less provisions aboard than it might need, less diversity of origin than discussion may benefit from, and perhap with insufficient skill to devise. It has not been a well founded launch nor one accompanied by a lifesaving fleet. Yet neither was our 1630 sailing so provided; yet we succeeded. Roxbury innovation must be cut free of interference, the complicated court games of government set aside, to succeed in the only way that success is assured : on its own. 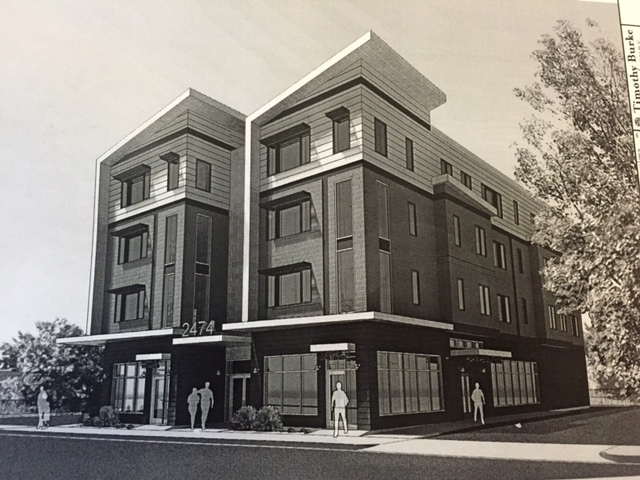 ^ the Waldwin Group’s proposed building at the corner of Washington Street and Malcolm X Boulevard in Roxbury Center. Coffee shop will locate on the fist floor. One of the stranger neighborhood conflicts to come to my attention in some time is the battle that has arisen between some residents of Fort Hill and a Dunkin Donuts franchisee. I can’t recall the last time that a coffee shop became the focus of neighborly opposition.To me, coffee shops are among the most docile of local businesses. Last night i attended a local meeting called to focus this opposition to coffee. About 25 people showed up, not including the activist who had notified me of the meeting. The 25 included some long time friends of mine as well as people of all age groups. Almost all expressed opposition to the City’s decision to award development of a certain parcel (see below) to a Dunkin Donuts franchisee called Waldwin LLC. Waldwin was chosen over two competitors, Placetailor and Urbanica. I do not in any way question the sincerity of their complaint that, as some said, no notice had been given of the proposal or the outcome. Nonetheless, the assertion made at the meeting, and in an online petition being circulated, that the Dunkin Donuts franchisee is not a local business is false. Waldwin is the brainchild of a very local businessman, Clayton Turnbull, who currently operates the Dunkin Donuts store in Dudley bus station and has done so or close to forty years. Many of the opposed residents may not know that Turnbull is also extremely active politically. in 2013 he served as finance chairman of Charlotte Golar Richie’s Mayor campaign; after she lost in the primary be became a superb speaker for candidate John Connolly. This year he is a donor to the campaign of City Councillor Ayanna Pressley. I have no doubt that Turnbull’s intimate knowledge of the development approval process enabled him to be selected over his two competitors. It was not a sure thing. I’m not much familiar with Urbanica, who it seems are already active developers in Fort Hill; but Placetailor I know well, and so does Fort Hill : last year the Jamaica Plain-based group built an innovative and handsome “high performance”: house on Beech Glen Street, and it remains an active developer in the Fort Hill area. The meeting’s moderator noted, lastly, that “there is half a billion dollars of development going on right now in Roxbury,” as if that were a bad thing. i do not see it as a bad thing. how can a vast infusion of risk capital into a neighborhood that until recently was starving for investment be a bad thing ? Tell that to local homeowners who have never had much money, thanks to racism, but who now see their homes worth a lottery ticket price — a large lottery ticket at that. For me, the upward success of Clayton Turnbull, as a long term local developer, is something to be celebrated. Roxbury needs to incubate success from itself, not always import it. Roxbury activists talk that language constantly. They cannot have it both ways. Generate local success stories, or see Roxbury bought up entirely from outside. Last night at least 250 voters showed up at Jubilee Church to hear the four candidates running in Boston’s only Council District contests. 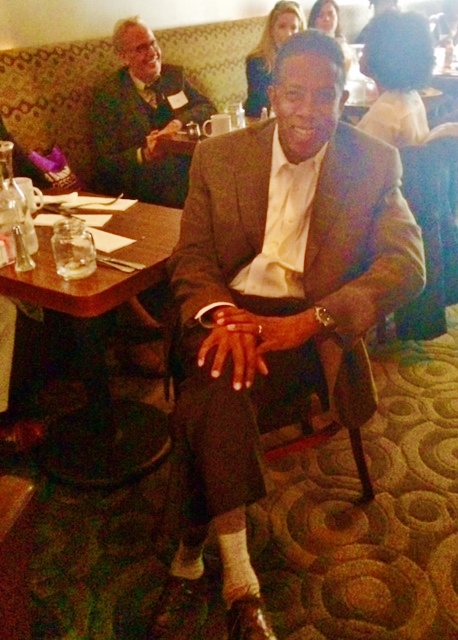 District 4 denizens heard from incumbent Charles Yancey and challenger Andrea Campbell. 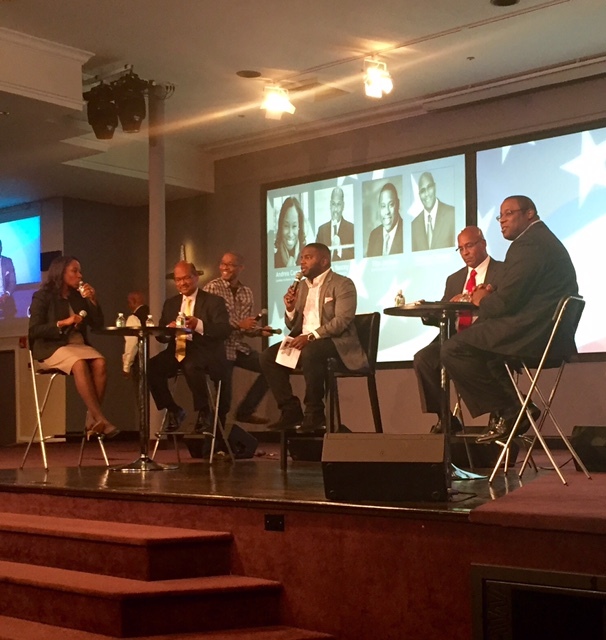 Council District 7 voters listened to challenger Charles Clemons and present Councillor Tito Jackson. Nor was it easy to listen as Jackson talked about how the Boston 2024 games bid — which he did much to wound — would have cost the city 13 billion dollars, a figure about three times higher than what even the anti-Games people cited during the 2024 debate. For all his and Clemons’s railings at the evils of charter schools, they spoke not one word about the many non-profit education organizations — based in these two Districts, too — that every year get thousands of kids from Districts 4 and 7 from high school to employment. Nor did Clemons or Jackson seem to care that charter school cap lift is a pressing issue for school parents in District 4 especially. 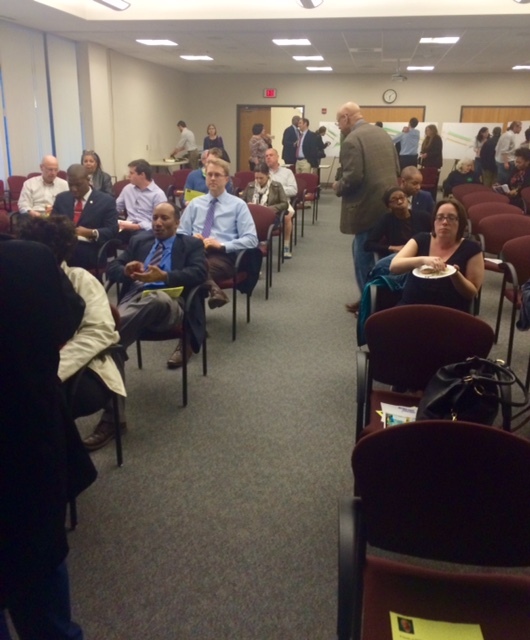 Do they never attend a Dudley Square Neighborhood Initiative education conversation ? Were they unaware of the hundreds of parents of color who rallied at the state House a few days again support of charter school cap lift ? Jackson, at least, knows better. he attended College Bound’s graduation ceremony at the Bolling Building about three weeks ago. From what was said, not much. District 4’s two candidates performed much better. Campbell (whom i am supporting) and yancey gave well reasoned, authoritatively detailed answers to questions. Each made clear a very diufferebt vision of what the role of District Ciouncillor shoulod be. campbell sees her work as being constantyly on the move, talking to voters in her Distriuct all the time, bbringting them information aboytr what is going in around them “a week in advance, not just on the day before, as happens now.” Yancey listed his accomplishments : among them, building the Mildred Avenue Community Center and the Mattapan Branch Library (which, as he was glad to announce, is named after his formidable mother, Alice Yancey). “I will fight for you,” said Yancey. Yancey also admitted a defeat : he has never been able to persuade a mayor to build a Mattapan High school. and, in answer to a charter school question, he cited that a larger percentage of public school graduates go to college than charter graduates : a talking point direct from the Citywide Parents Council that ignores the competitive nature of charter schools, from which many children drop out. This despite Yanc ey’s having been happy to attend the ribbon cutting for an expanded Codman academy scarcely two weeks ago. Campbell, meanwhile, hinted at recognition or schools other than standard public. She certainly knows, having attended a Bottom Line fundraiser at Antico Forno in the North End a few months back. “poverty and race play a role in school underperfiormance in this District,” she said, “and we need to address that.” As an example, she cited the excellence of Worcester’s technology academy — a role model for what Governor Baker wants to bring to many big city school districts. Campbell won the District 4 primary overwhelmingly; Yancey is playing a steep game of catch-up. Yet the two candidates aren’t making voters’ November choioce easy: both speak well and know their role. The same, actually, can be said of the District 7 race ; two candidates who speak loudly and loosely with the facts, each given to showmanship — Clemons as “Brother Charles’ of 108 FM “Touch Radio,’ Tito Jackson as master of the “Tito dance,’ whose presence on youtube he mentioned and demonstrated. Perhaps it will go viral yet. Both Rodney Singleton, our Seen From the Hill columnist, and I, former Roxbury Mayor Thomas Dudley writing The Dudley files, agree that the plans afoot to rename Roxbury’s central square, and adjoining regions, as “Menino City,” would be a significant degrading of our settlement. Those who traveled the full width of the Atlantic Sea with me to establish here a Puritan congregation did not fail; in our mission. Our triumph, which has made possible the triumphs of all who have come into Roxbury because of what we have accomplished, finds its memoriam in the names that our successors have put upon Roxbury’s central places. However unforeseen, and bold, and surprising, the re-imaginings adopted by our successors, all profit by the legitimacy given them by their honoring the unforeseen, bold, and surprising re-invention. Honor is assured to the new by the place names of old. That the name sought to be set aside is my own, is of consequenced to me, of course; but I speak not only for myself and the Dudley family. If my name, brought here across every hardship and in the face of every ill wind, can have its fortitudes supplanted, how will my triumph be of any example ? Pride there is in my claim to be remembered even now, when I am no longer by the flesh among you; and pride might yet be an example to you of today, along with your boldness and your surprise — how may it incommode you to have to re-invent pride when said pride is already present in your midst ? May it trouble your officers, keep my name upon our chiefest square not as a clinging to what is old but as an example of how bold new the first Roxbury thing new really was. Nearly 22% of Roxbury households living in poverty struggle to earn the $10,000 dollars in funding Nuestra Communidad is squandering to rename and some say rebrand parts of Roxbury in memory of the late mayor Tom Menino. As if a poor mix of for sale housing affordability, failed retail anchor in Wal-Mart, leasing land it cannot develop, giving artist all the credit over an entire community, or selling once public lands it owns to a charter school most kids in Roxbury cannot attend were not enough. Nuestra CDC the developer now sees fit to reamed parts of Roxbury for its own gain? Mr. Price, head of Nuestra, would never try this in his home town of Milton! Many watched in horror when Alex Haley’s Roots aired showing slaves whipped into submission to accept the name given by their slave masters. When did Roxbury and parts of her become Nuestra’s or any other developer’s chattel in need of a name for profit? Truth is: we won’t be whipped into submission ever again! Roxbury is free to choose her own name if and when required. Right now we’re Roxbury Proud! Roxbury Strong! Roxbury Forever! 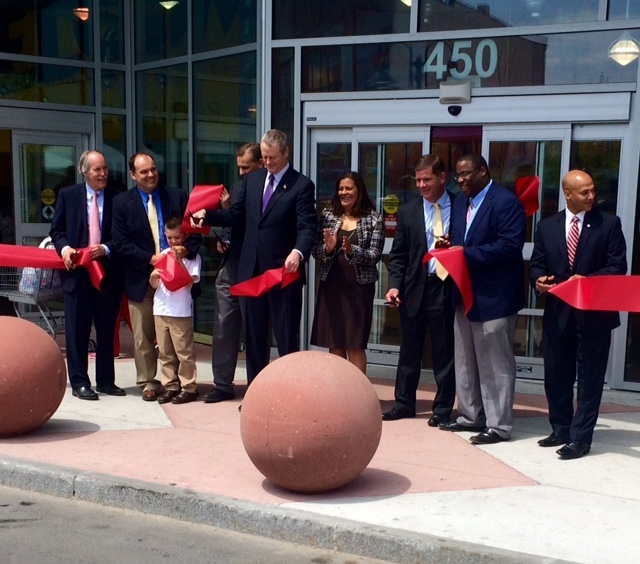 ^ private investment takes the lead in Roxbury now : Governor Baker presides at ribbon-cutting opening of the new Tropical Foods supermarket along Cass Boulevard. This week Governor Baker announced that he was putting on hold the previously planned move of the Department of Transportation (DOT) to our neighborhood. Baker gave his reasons : first, the State hasn’t found a buyer for the DOT’s current headquarters in Park Square; second, Baker feels that the DOT needs to focus on fixing the state’s transit difficulties and not be distracted by such a huge move; and third, the move may n ot be necessary, after all, for its original purpose. When Governor Patrick first ordered the move, it foresaw bringing a large number of government employees, some quite well paid, into a neighborhood that then badly needed such an economic boost. Instead, the boost was given by the City of boston moving its School department central office into the refurbished Ferdinand Building in Dudley Square. That building — indeed, the entire block — now renamed for the late Bruce C. Bolling, is now office to over 500 school employees, many of them well paid. The move has brought plenty of change to Dudley Sauare, and much investment. The grand opening, three weeks ago, of Tropical Foods’s new supermarket, makes that clear. It no longer seems necessary to use government offices as a catalyst to business development in our neighborhood. Why should it ? Melnea Cass Boulevard brings commercial traffic directly to us. Where Cass Boulevard meets Tremont Street, it carries that traffic forward past Roxbury Community College to Jackson Square, where almost every parcel has been aggressively developed. As development creates an almost entirely different Roxbury, and doing it faster than most of us realize, the delay in moving DOT to Tremont Street may well result in private investors filling DOt’s intended space with the sort of mixed-use creations currently favored throughout the City. Restaurants, retail space, residences, parking, and amenities seem very likely to beiome destination calling cards to the thousands of young, technology and tech-world innovators who are making Boston a city of pioneers. Until not long ago, Cass Boulevard has acted as a sort of border between traditionally residential Boston and the downtown pioneers. That no longer holds. Today the “border” lies a mile further south, along Malcolm X Boulevard. Roxbury in 2015 is a destination for innovators and their innovations. If in three or four years time policy makers still want to move the DOT to a needy neighborhood, Mattapan would seem a better choice. No neighborhood in the City has been less touched by the “Boston boom” than the 15,000-people village at the terminus of Blue Hill Avenue. “Nuestra Comunidad seconds the call for representative community bodies with substantial review powers. Legitimacy through elections would be welcome. One over-looked issue is how poorly review committees, appointed or elected, have represented the community. Specifically, tenants represent the majority of Roxbury, and every other Boston neighborhood, but are almost always under-represented and sometimes un-represented on project review committees. The result is that homeowners dominate these committees. For better or worse, some homeowners in recent years, looking to bolster property values, have opposed affordable housing and called for 100% market rate development. It’s now crystal clear that such calls feed the escalating real estate market in Roxbury now resulting in gentrification and displacement. Tenants would not be inclined make this catastrophic error. Tenants are on the front line of gentrification and displacement. “Also, tenants know through their lived experience that stable affordable housing is a platform for success for families. It allows for financial planning and savings. Nuestra’s experience is that every year, families leave our housing to buy a home. That is the reality of affordable rental housing, a reality that tenants understand first hand and that homeowners often mis-understand based on second-hand information. “Let’s ask the BRA and DND to create a tenant representation policy so that project review committees truly represent the majority of Roxbury. “No doubt everybody in Roxbury welcomes a diverse community body with substantial review power. “But review committees don’t fail or represent their constituency poorly because they lack an adequate voice from renters! Quite the contrary, homeowners that serve on these boards were once renters and renters also serve. Homeowners don’t dominate these review committees at all. Homeowners and renters have equal skin in the game! “It’s also clear why tenants represent the majority of Roxbury households: corporate landlords like Nuestra CDC, City Realty and other CDCs perpetuate the tenant culture in Roxbury. And why not, it serves their needs! A portfolio of property ownership and management is lucrative, even if it is on the backs of the struggling and poor! “For better or worse, some homeowners in recent years, looking to bolster property values, have opposed affordable housing and called for 100% market rate development.” Boy if that’s not pot calling the kettle black! Aren’t CDCs, corporate land/home owners, bolstering their own position as landlords by de-basing the legitimate voice of Roxbury homeowners and expanding their own interests of the tenant culture in Roxbury? “Average homeowners in Roxbury are far from being corporate entities and by all accounts aren’t calling for 100% market-rate housing! We do acknowledge a skewed concentration of affordable housing in Roxbury that has left a dearth of workforce housing in the middle, where families cannot qualify for subsidized housing, or afford market-rate housing and find few options. Homeowners have advocated this imbalance in housing be more balanced to accommodate more struggling families squeezed in the middle. “As tenants become homeowners, homeowners realize the best hedge against gentrification is to own the ground you wish to hold! “In Roxbury, homeowners don’t bolster their property values! It’s more a question of quality of life because it’s home. By the way, renters seek that same quality of life. In fact, it’s pretty certain this is not unique to Roxbury. Pretty sure the idea of home is common in places like Milton, Wellesley, Weston, Needham and 347 other cities and towns across the state. There’s no lack of understanding on the part of homeowners when it comes to renters, we all call it home! “Homeowners and renters advocating for a better quality of life in their own neighborhood does not feed an escalating real estate market in Roxbury to the point of gentrification and displacement. “The riots in Baltimore remind us of the root causes of marginalization and gentrification/displacement when your neighborhood suddenly becomes popular: poor schools and lack of training options, lack of access to good jobs, and lack of access to business opportunities. “If community development corporations like Nuestra CDC are really interested in fighting gentrification and displacement, perhaps they should divest their real estate holdings and invest in education, access to jobs and access business opportunities? 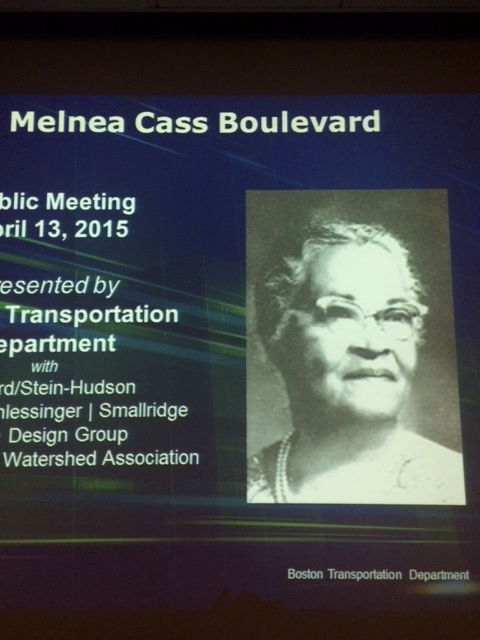 Last night I attended a meeting of the planning group working on renovation of Melnea Cass Boulevard. The invitation came from Madison Park Development Corporation (MPDC), which oversees the creation of newness for the neighborhood that Cass Boulevard passes through, but it is the City, not the MPDC, that has charge of rebuilding the road. At the meeting I learned that that is and was a mistake. Many people attended, many of them spoke. State Representatives Rushing and Fox were present,as was Councillor Jackson. I applaud their diligence; both Rushing and Fox have been at this as long as I have ! The attendance of all is a good thing, and I do not fault any of those who came or those who spoke for the failures I see in the project, which is now well along in its process of design and review, review and design. The failure is the project itself. First of all, why do we even need it at all ? I drive Cass Boulevard every day. It executes its mission well, which is to swi9ft commercial traffic from the I-93 Massachusetts Avenue exit across the entire neighborhood of avenues and streets overt to the Roxbury Crossing, Tremont Street side of the City thence off to “JP,” Rozzie, and points South. The boulevard — named after a heroine of Boston politics Melnea Cass, who back in the day shjepherded a young Roxbury resident, Ed Brooke, all the way to the US Senate — is of functional design. It isn’t a sightseer’s route. It has a job to do, and it does it. Nor is the road in disrepair, or poorly lit. If roads can be described as fit, Cass Boulevard is fit, very fit. So what’s the point ? Why does the City need to spend $ 9,000,000 — plus additional Federal millions — to fix what isn’t broken ? The result of this unneeded project is that the Lower Roxbury community now has its chance to change the function of Cass Boulevard; to narrow it and add grass-way in the center strip, to add bike lanes, to render Cass Boulevard basically a neighborhood street rather than a flow-through parkway. Again : I do not blame the residents of Lower Roxbury for using the opportunity handed to them. Cass Boulevard does indeed cut a very noisy, busy, high-traffic swath through a neighborhood almost entirely residential. It is not simple to walk across the boulevard from the Roxbury side to the South End side. Cass Boulevard has, actually, become a sort of barrier : to its north, gentrification and very high pr8ice homes; to its south, long-term neighbo0rs and homes less than half as pricey. There also used to be racial break : Caucasian to the north, people of color to the south., That is changing, rapidly so. Curiously — and I doubt that the Lower Roxbury group sees this — remaking Cass Boulevard as a neighybo9rhood street, wider than most, maybe, but no longer a purely functional swath, will abet the transformation of Lower Roxbury by eliminating the barrier effect. The streets between Northampton on the north and Dudley Square on the south,m will now be one neighborhood, and house prices will rise quickly throughout, as the market power and style cachet of the South End engulfs streets like Williams, Ruggles, and Shawmut, and all of Madison Park itself. Perhaps the residents do in fact see this and are waiting for the price to reach their I-will-sell mark. That, of course, is something residents at meetings never ever say. But I digress…. The redesign meetings go on. My feeling is that they will result in a little bit of this and a little bit of that, to nobody;’s real satisfaction,and that a perfectly good crossway will become something imperfect to everyone’s needs. That to me is not a good way to spend $ 16,500,000 of taxpayer money. 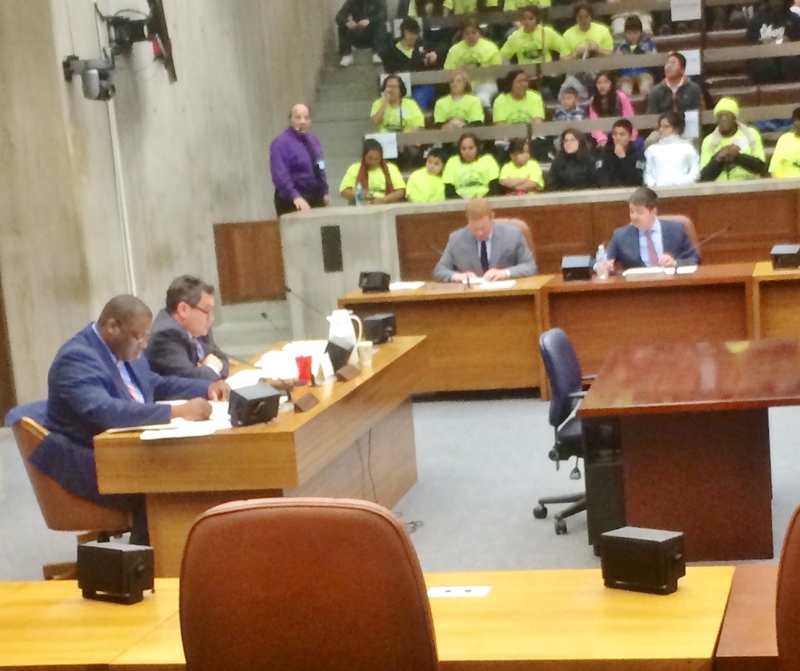 ^ Councillors Tito Jackson, frank aker (chairman), Matt O’Malley and Josh Zakim heard testimony on the City’s 40,000-unit affordable housing initiative. In the gallery, City Life activists in yellow T-shirts. Yesterday the City Council’s subcommittee on Housing heard from several witnesses at “Part 2” of its foray into Boston’s most difficult contradiction : the need for “affordable” housing and how to make it happen. I put “affordable” in quote marks because interested parties cannot even agree, out loud, on what constitutes affordability. Actually, we all know what is meant when advocates say “affordable.’ They mean housing that people earning smallish incomes — how small ? smaller, I guess, than the incomes of Boston’s “new” people — can pay for. Ad here begins the contraction inherent : because by “affordable,’ advocates mean housing that costs less than the current market accepts. Thus, housing paid for at least in part by some form of taxpayer subsidy. In other words, housing that is at least in part, public housing. The contradictions do not end there. The advocates for “affordable” housing — and there were hundreds at the Council hearing — don’t want tenancies, they want ownership. They want housing with all the normal amenities — who doesn’t ? But how to do that ? how to give those who want “affordable” housing homes that they don’t fully have to pay for ? To put it differently, who will pay the difference between what advocates are willing to pay and the actual price of said housing ? Many methods of providing such housing were profferred at the hearing, some wiser, some quite unwise, some superficially nice but with deadly consequences. All amount to public housing. One suggestion — the “community” land trust — resembles the mobile home park concept. All involve a huge transfer of market pricing from those who can pay it to those who can’t. Many of the suggestions entail huge hurt. How, for example, do we explain to the elderly Roxbury homeowner who, never having had much money in his or her life, now finds that his or her home — probably without a mortgage — is worth a million dollars, or more and that he or she can cash that million out to a “gentrification” buyer, that his or her house is now worth less because the neighborhood has been targeted for vast tracks of subsidized “affordable” housing ? Or, to cite another example, the so-called “just cause” eviction law that advocates want, how do we tell the owner of rental housing that since a buyer who can’t evict the tenants isn’t likely to buy at all, that his hitherto very valuable real estate is now worth much, much less ? Real estate whose taxes he has paid and whose repairs and maintenance he has made, maybe at great cost ? As for the “Community” Land Trust concept : is there really a market for buying homes that do not own the land they are built on, where resale prices are restricted — despite a booming market — by the trust instrument and where the actual land — now likely worth much more than the homes built on it — is owned by the trust’s beneficiaries and can be sold out from under, by a vote of those beneficiaries, at any time ? If we are going to advance home ownership for those with smallish incomes, how dare we promote this sort of shell game ? Let the homeowner own the land on which his or her house is built ! 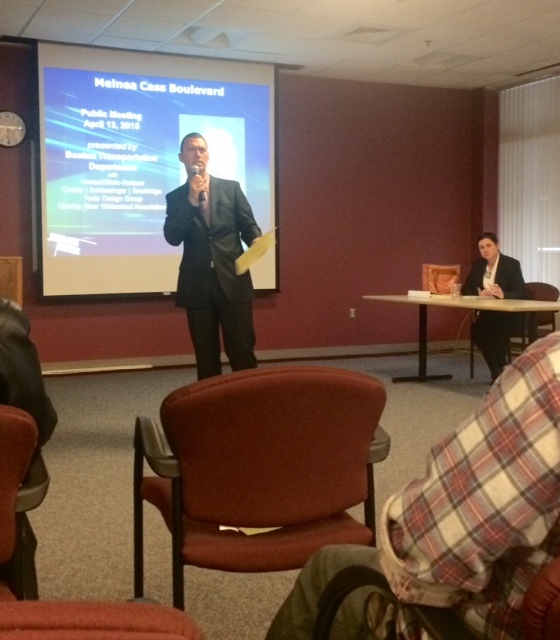 The Council’s hearings on “affordable housing will continue. So will the discussion, of evictions and market rents, lottery-win house prices, “gentrification” and “displacement.” We have heard ot all before. We heard it in the 1970s, when Roxbury housing was cheaper than cheap (minne was $ 35 a month, on Fort Avenue, no less), if you were willing to live in unrenovated flats with hospital-green walls, where electric lightbulbs dangled flammably from the ceiling; with only a gas stove to heat the bedroom; with door locks easily jimmy’d — in a neighborhood rife with all manner of crime : twice I had my car stolen. We heard it in the 1980s, when the first housing boom arrived and, with mortgages now available — early in the 1970s Roxbury was “red-lined” except by John Bynoe’s Progressive Credit Union– everyone who could sell, sold. Rioxbury housing is no longer cheap. Most of it is no longer “affordable.”‘ there is much “gentrification” — the term used to mask simple racism : where are all these white-ies coming tom ? There is also displacement, because, yes, many Roxbury residents cannot afford the $ 2,200 to $ 4,200 rents now found in 02119 zip code postings at zillow.com and trulia.com. ut in Roxbury today there is also much renovation of homes, some new home building, and — thanks, let’s admit, to the greater political and economic power that well off Whites command — vastly more clout for all of our community at City Hall. Roxbury might even now be able to absorb the money transfer cost of subsidizing liveable below-market housing for many residents, without creating a Stigma Block or a mobile home park, without imposing hard-to-evict rules on landlords, without losing the market boom that has brought a bonanza to long-term home owners and thus made Roxbury a dynamic, innovating place in which many businesses now rush to locate.